I congratulate and thank the Shield Watch U.S. and India teams for their exceptional contributions to this company. We are proud of our achievements in such short order and this award sets the benchmark even higher for the coming years. Inc. magazine has ranked Shield Watch No. 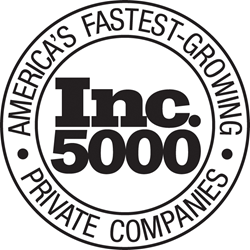 4582 on its 35th annual Inc. 5000, the most prestigious ranking of the nation's fastest-growing private companies. The list represents a unique look at the most successful companies within the American economy’s most dynamic segment— its independent small businesses. Companies such as Microsoft, Dell, Domino’s Pizza, Pandora, Timberland, LinkedIn, Yelp, Zillow, and many other well-known names gained their first national exposure as honorees of the Inc. 5000. “I congratulate and thank the Shield Watch U.S. and India teams for their exceptional contributions to this company. We are proud of our achievements in such short order and this award sets the benchmark even higher for the coming years,” said Shield Watch CEO Pratik Roychoudhury. The 2016 Inc. 5000, unveiled online at Inc.com and with the top 500 companies featured in the September issue of Inc. (available on newsstands August 23) is the most competitive crop in the list’s history. The average company on the list achieved a mind-boggling three-year growth of 433%. The Inc. 5000’s aggregate revenue is $200 billion, and the companies on the list collectively generated 640,000 jobs over the past three years or about 8% of all jobs created in the entire economy during that period. Complete results of the Inc. 5000, including company profiles and an interactive database that can be sorted by industry, region, and other criteria, can be found at http://www.inc.com/inc5000. The annual Inc. 5000 event honoring all the companies on the list was held from October 18 through 20, in San Antonio, TX. Shield Watch’s President Tom Perricone and CTO, Dante Pasquarelli, attended the function to receive the honors on behalf of the company. Speakers included some of the greatest entrepreneurs of this and past generations, such as best-selling author and strategist Tony Robbins, SoulCycle co-founders Elizabeth Cutler and Julie Rice, Cornerstone OnDemand founder, president and CEO Adam Miller, Marvell Technology Group director and co-founder Weili Dai, and New Belgium Brewing co-founder and executive chair Kim Jordan. Between 2013 and 2015, Shield Watch’s revenues increased by 54%. During that time the company launched its transformative technology consulting framework called LEVER IT℠. This methodology helps SMB companies to develop a robust IT Roadmap, Software Roadmap, Security Roadmap and a Marketing Roadmap and enables them to leverage technology to grow their top line and make a substantial impact on bottom lines. The 2016 Inc. 5000 is ranked according to percentage revenue growth when comparing 2012 to 2015. To qualify, companies must have been founded and generating revenue by March 31, 2012. They had to be U.S.-based, privately held, for profit, and independent—not subsidiaries or divisions of other companies—as of December 31, 2015. (Since then, a number of companies on the list have gone public or been acquired.) The minimum revenue required for 2012 is $100,000; the minimum for 2015 is $2 million. As always, Inc. reserves the right to decline applicants for subjective reasons. Companies on the Inc. 500 are featured in Inc.'s September issue. They represent the top tier of the Inc. 5000, which can be found at http://www.inc.com/inc5000. Founded in 1979 and acquired in 2005 by Mansueto Ventures, Inc. is the only major brand dedicated exclusively to owners and managers of growing private companies, with the aim to deliver real solutions for today's innovative company builders. Winner of the National Magazine Award for General Excellence in both 2014 and 2012. Total monthly audience reach for the brand has grown significantly from 2,000,000 in 2010 to over15,000,000 today. For more information, visit http://www.inc.com.